What should companies be doing to prevent disasters such as the ongoing catastrophe in the Gulf of Mexico, with its tragic loss of life and environmental devastation? Granted, some disasters are just ‘Black Swans’ (see Nassim Nicholas Taleb’s writings on this topic) and can’t be predicted. But company safety procedures can go a long way toward mitigating the risks of accidents and their potential effects. They developed technology to better control chemical process. They developed standards to built safer facilities. They didn’t do this alone. They worked closely with other chemical companies. The whole industry invested in best practices and shared what they learned. When I started my job [in the 1970s] I was given a set of “standards” consisting of 3 binders, each 6 inches thick — serious reading. The result of the study was sweeping changes in how much material was stored in each facility. Many processes and lines of business were deemed too risky to continue and were shut down. Monsanto walked away from tens of millions in business to reduce risk and improve safety. These comments emphasize the value of adopting the stance of a “learning organization.” What kinds of company policies and practices can go the furthest in preventing accidents, loss of life, and environmental damage — and in minimizing the effects when accidents do occur? Not only has the music group the Grateful Dead created a musical and cultural phenomenon, but as a very successful business, they make a good case study in management. That’s the conclusion drawn by Joshua Green, writing for The Atlantic — see “Management Secrets of the Grateful Dead,” March 2010. Without intending to—while intending, in fact, to do just the opposite—the band pioneered ideas and practices that were subsequently embraced by corporate America. One was to focus intensely on its most loyal fans. It established a telephone hotline to alert them to its touring schedule ahead of any public announcement, reserved for them some of the best seats in the house, and capped the price of tickets, which the band distributed through its own mail-order house. If you lived in New York and wanted to see a show in Seattle, you didn’t have to travel there to get tickets—and you could get really good tickets, without even camping out. “The Dead were masters of creating and delivering superior customer value,” Barry Barnes, a business professor at the H. Wayne Huizenga School of Business and Entrepreneurship at Nova Southeastern University, in Florida, told me…. In the early days of Internet marketing, I remember reading the article by Dead songwriter John Perry Barlow, in Wired magazine of March 1994, “The Economy of Ideas: A framework for patents and copyrights in the Digital Age. (Everything you know about intellectual property is wrong. )” I was impressed at the time by his prescient grasp of the intellectual-property issues presented by the Internet and online commerce. With physical goods, there is a direct correlation between scarcity and value. Gold is more valuable than wheat, even though you can’t eat it. While this is not always the case, the situation with information is often precisely the reverse. Most soft goods increase in value as they become more common. Familiarity is an important asset in the world of information. It may often be true that the best way to raise demand for your product is to give it away…. In regard to my own soft product, rock ‘n’ roll songs, there is no question that the band I write them for, the Grateful Dead, has increased its popularity enormously by giving them away. We have been letting people tape our concerts since the early seventies, but instead of reducing the demand for our product, we are now the largest concert draw in America, a fact that is at least in part attributable to the popularity generated by those tapes. True, I don’t get any royalties on the millions of copies of my songs which have been extracted from concerts, but I see no reason to complain. The fact is, no one but the Grateful Dead can perform a Grateful Dead song, so if you want the experience and not its thin projection, you have to buy a ticket from us. In other words, our intellectual property protection derives from our being the only real-time source of it. Insights from thinkers like Barlow led me to write my 1995 e-book, The Smart Business Guide to Internet Marketing, one of the first e-books published and sold online (now archived for free at Optimization Marketing). In fact, Barlow was one of the people who bought a copy, although I don’t flatter myself by thinking there was much in it that he hadn’t already thought of. I think a key insight from the Grateful Dead case study is that a successful business ultimately has to rest on customer relationships. Interactive media and technologies place unprecedented control in the hands of customers, and the smart business these days is the one that realizes that the success of its brand will rest on its customer experience. What people today are beginning to realize is what became obvious to us back then—the important correlation is the one between familiarity and value, not scarcity and value. Adam Smith taught that the scarcer you make something, the more valuable it becomes. In the physical world, that works beautifully. But we couldn’t regulate [taping at] our shows, and you can’t online. The Internet doesn’t behave that way. But here’s the thing: if I give my song away to 20 people, and they give it to 20 people, pretty soon everybody knows me, and my value as a creator is dramatically enhanced. That was the value proposition with the Dead. Reading Andrew Robinson’s fascinating book Lost Languages: The Enigma of the World’s Undeciphered Scripts (2002, McGraw-Hill), I recently learned the amazing story of the decipherment of the Linear B script by amateur philologist Michael Ventris in the 1950s. Linear B is a script discovered on the island of Crete by archaeologist Sir Arthur Evans. Evans never deciphered Linear B, as he had fallen too much in love with certain precious ideas, chiefly his belief that the culture he had uncovered through his excavations at Knossos was a great noble civilization (which he called “Minoan”) that had dominated the Aegean in ancient times. As it turned out, Linear B was a syllabic script used to write ancient Greek. However, the decipherment of the script was delayed by many decades because Evans was reluctant to share the inscriptions with other scholars. When death finally wrested the inscriptions from Evans’s hands in 1941, other scholars were able to begin a concerted effort at decipherment. Although it was Ventris’s genius primarily that cracked the script, he didn’t do it alone, which is a crucial point. Although a brilliant scholar with a lifelong fascination for Linear B, Ventris was in fact not a professional philologist or linguist. 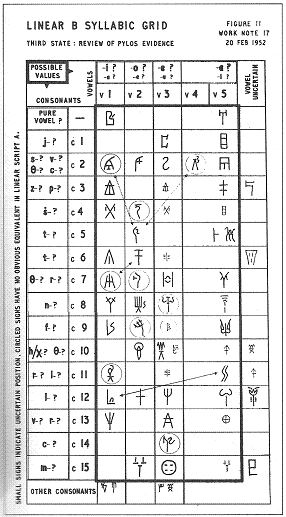 Ventris was an architect, and I think his architectural training, discipline, and practices were an important contributing factor in his success with Linear B.
It’s interesting to note that Ventris’s grid-based system for decipherment is reminiscent of the schedules architects use to lay out information in their drawings. But more important for Ventris’s success with Linear B was his value of collaboration, also an important architectural practice. Ventris explained in writing and in tremendous detail each stage of his attack on Linear B, and then circulated these neatly type “Work Notes” (Ventris’s name for them) to other scholars for comments and contradictions. Much of what he hypothesized turned out to be irrelevant or wrong, but this did not stop him from showing it to the professionals. And it appears that he did take this whole approach from his work as an architect. To me this stresses the immense value of multi-disciplinary teams, cross-fertilization, and collaborative approaches in all kinds of innovation work. Also important was Ventris’s humility and willingness to recognize his own errors, in contrast to Evans’s stubborn insistence on his Minoan theory. This is a worthy example for all experts, who are far too inclined to hop on a particular hobby-horse and just keep on riding it for their entire careers. These lessons bring to mind some research that we have done at the Institute for Innovation in Large Organizations in the area of cross-functional teaming, a valuable process for innovation work. Bringing people from many disciplines and functions together in design teams offers great potential as a strategy to produce innovative products. However, such diversity also lays the groundwork for conflict. Thus team leaders and company management need to manage team diversity so all members can be effective and make their contribution. Bob Pagano of Red Sky Insights points out that diversity can bring value to the product design process by putting blue-sky innovators in the same room with more hard-nosed practical players. You’re going to have some people around the table who are really creative and are going to look at the assignment with a really open mind. You want to have some very creative people early on who might see something outside the normal way of doing things. If they say something really bizarre, we don’t necessarily want to discourage that. But you also need some enforcers, the ones who are going to put up the barriers, the ones who will push back, but trying to reach a common ground. They might say, ‘Well, that’s interesting. Let’s see if we can do that within the rules on the retail end.’ It’s kind of a give and take to see that nothing gets overlooked. Innovation consultant Stephen M. Shapiro, previously an Accenture consultant, believes that it is important to “understand the various innovation styles of team players” to make use of their distinctive strengths. Analytical people tend to be more focused on intellectual activities and often find flaws in everything. Structured people want to know the plans and how things will be carried out. They also are a bit more critical but are more action oriented. Creative individuals are cerebral yet like to think broadly. They are enthusiastic and generators of new ideas. But they are often poor at implementation. Relationship-oriented people are needed to get anything done as they can engage the organization. But they often are too focused on consensus, which is a barrier to innovation. The innovation process goes from analytical—define the problem . . .
to creative—define solutions . . .
to structured—define plans . . . Thus, the various players’ personal styles can come to the fore at different stages of the group’s work. But do team diversity and cross-fertilization translate into financial results? The financial value of the innovations resulting from such cross-pollination is lower, on average, than the value of those that come out of more conventional, siloed approaches. In other words, as the distance between the team members’ fields or disciplines increases, the overall quality of the innovations falls. But my research also suggests that the breakthroughs that do arise from such multidisciplinary work, though extremely rare, are frequently of unusually high value—superior to the best innovations achieved by conventional approaches. A couple of years ago while working on a project. I thought of the idea of “lenses and levers” as a simple but valuable way of thinking about organizational development tools. At the time, I just noted it down on the outside of the project file folder (I’m cleaning out old files today) and thought I should capture it in a more permanent location. “Lenses” are methods and tools that allow you to view and understanding what’s going on in the organization. Reports, surveys, metrics, analytics, and dashboards are examples in this category, as well as more qualitative approaches like ethnographic research. “Levers” are tools that allow you to alter or control what goes on in the organization. These might include governance, strategic planning, management, training and development, communications, and incentives.